The Digg Import extension enables you to query the social news site Digg and returns the results in a table. This extension uses the Digg API and lets you query based on date, story category and user name. With the Digg API, you have access to the entire history of the Digg database since its inception in December 2004. Digg is a social news site that allows anyone to submit news stories. Users then “digg” the stories they like and the most popular items bubble to the top of the list and, if popular enough, to the front page. During the bubbling process, they are considered “upcoming” stories; once they reach the front page, they are considered “popular” stories. 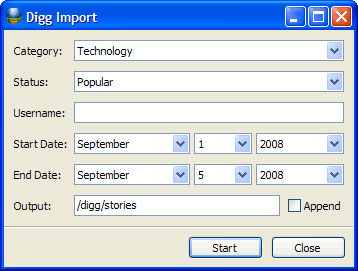 After installing the extensions, select “Digg Import” from the Tools menu and the Digg Import dialog will appear (click on the thumbnail above to see a full resolution screenshot). — Category: This is the category where the story was originally submitted, such as Technology, Sports, etc. — Status: This is the type of story you want to receive, such as upcoming stories or those that hit the front page of Digg. — Username: Instead of selecting a category of stories, you may instead select stories submitted by a specific Digg user. — Start Date: The first date of the range you wish to return. This will return stories that were submitted from 12:01 AM on the day you select. — End Date: The last date of the range you wish to return. This will return stories that were submitted up to 12:00 PM on the day you select. — Output: The folder and filename of the output table in your project. — Append: If you have previously queried Digg and want to append additional records to that table, make sure you are using the same file name and path and then check the Append box. The new records will then be appended to the existing table. Once you have defined your query, click Start and the import process will begin. NOTE: The Digg API employs a throttle which limits importing to groups of 100 records every 10 seconds. If your output table is large (such as selecting all upcoming Technology stories for a month), you will need to provide significant time for the query to process due to this throttle. Hi, I tried this extension but it retrieves only the most recent diggs regardless of the dates entered. Is this because of the Digg v4 overhaul? We haven’t updated/tested this extension for the Digg version 4 yet. Given the overhaul Digg made on this last version, I wouldn’t be surprised if their API changed enough to cause problems with this code.